Citron is a large lemon-like fruit borne by a slow-growing shrub or small tree reaching 8-15 ft high with stiff branches and stiff twigs and short or long spines in the leaf axils. 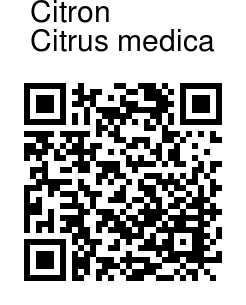 Citron is probably native to North-East India. The leaflets are evergreen, lemon-scented, ovate-lanceolate or ovate elliptic, 2.5-7 in long, leathery, with short, wingless or nearly wingless petioles. The flower buds are large and white or sometimes purplish. The fragrant flowers about 4 cm wide, in short clusters, have 4 to 5 petals, sometimes pinkish or purplish on the outside, with 30 to 60 stamens. The fruit is fragrant, mostly oblong, obovoid or oval, occasionally pyriform, but highly variable; various shapes and smooth or rough fruits sometimes occurring on the same branch. The citron is unlike the more common citrus fruit like the lemon or orange. While the most popular citrus species are peeled in order to consume its pulpy and juicy segments  the citron's pulp is very dry containing only little insipid juice. Medicinal uses: Juice- It is indicated in mostly digestion related problems. It also acts in stimulating liver for proper secretion of bile juices. It is also given in conditions like nausea. Leaves are externally used in case of pains and inflammation on the external body part. 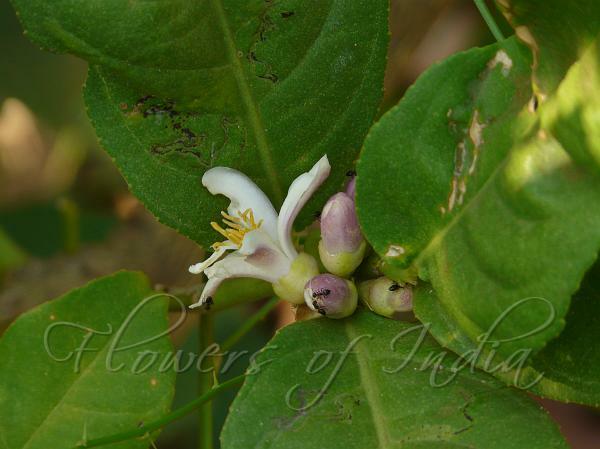 It is also used on skin disorders and also relieves from itching. Paste made out of seeds is also very helpful in scorpion bite. Identification credit: Eby Abraham Photographed in Maharashtra.